Note: The statistics below have been collected, compiled and estimated by GTM Research for PVNews' 29th annual PV production data collection effort. Data for select Japanese producers was kindly provided by RTS Corporation. Coming off the back of an enormously difficult business environment in 2011, 2012 offered little respite for the global PV manufacturing industry, with overcapacity continuing to loom large and severely compressed profit margins for even the lowest-cost producers. Given the inventory overhang that plagued the market through much of the year and the fact that the 28.8 gigawatts of global installations in 2012 represented only a marginal increase of 2 percent over 2011, it was therefore understandable that production levels declined year-over-year for possibly the first time ever in the history of the industry. In the face of quickly eroding balance sheets, producers adopted a more cautious approach toward utilization levels in the second half of 2012, thus keeping overproduction in check. This indicates that some lessons seemed to have been learned from 2011, when a stubborn refusal to curb production in the face of a sluggish market led production to exceed installation levels by an astonishing 42 percent. 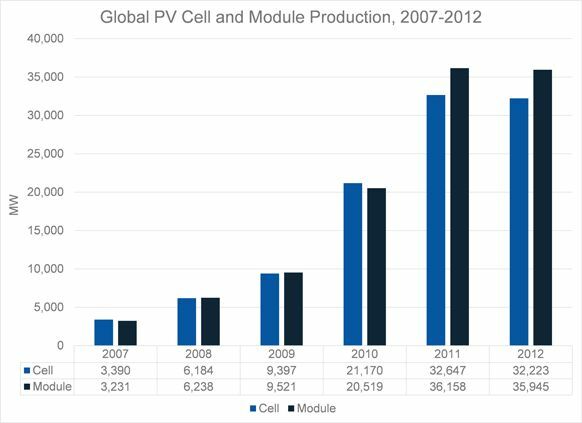 Overall, GTM Research estimates that 2012 global cell and module production totaled 32.2 gigawatts and 35.9 gigawatts, respectively, a 2 percent decline from 2011 levels. The contrast between 2012 and the preceding five years could not be any sharper: from 2006 to 2011, cell production grew at a compounded annualized rate of 68 percent. A total of 63 percent and 64 percent of cells and modules produced in 2012 were made in mainland China, which is a marginal increase over 2011 (62 percent and 59 percent). 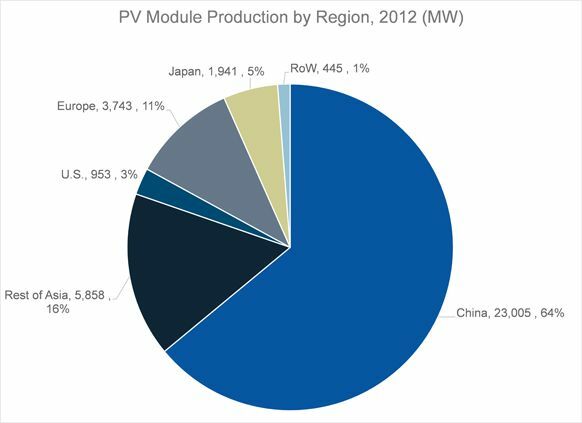 In total, Asia made up 86 percent of global module production, with the production share of Japan and the Rest of Asia region (primarily Taiwan and South Korea) remaining more or less flat compared to 2011. Looking at cell production, Asia’s position is even more dominant, with an estimated 95 percent of cells being produced there in 2012. Overall, module production out of China grew by 5 percent, while that figure in the rest of the world dropped by 12 percent. 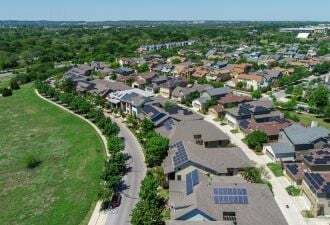 The declines were most stark in the U.S. and Europe, where annual production of modules dropped by 20 percent and 25 percent, respectively, with a number of large plant closures taking place over the last two years in these regions (Evergreen Solar, Solyndra, Schott Solar, REC, Sovello). Together, the U.S. and Europe constituted just 14 percent of global module production in 2012, down from 17 percent in 2011 and 43 percent in 2007. 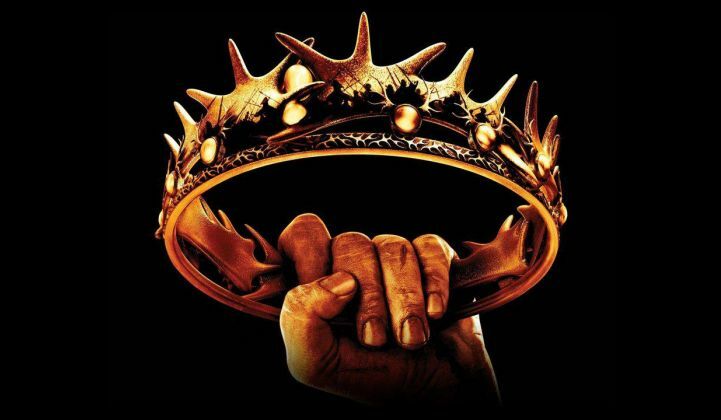 Clearly, the antidumping and countervailing duties imposed on Chinese cell producers in the U.S. last year have not resulted in any major benefit for American manufacturers; it remains to be seen whether the same will be true of Europe, which is pursuing its own antidumping investigation against Chinese wafer, cell and module producers. Crystalline silicon (c-Si) technology made up 89 percent of module production, compared to 86 percent in 2011. This means thin film, after years of steady increases, has lost production share for three years in a row, falling from 21 percent in 2009 to 11 percent in 2012, which is similar to 2007 levels. While overall c-Si module production remained essentially flat at around 31.3 gigawatts, thin film output was down by 18 percent from 2011. This reflects the challenges faced by thin film given the steep cost reductions and efficiency improvements experienced by c-Si in 2011 and 2012. Going forward, we expect thin film share to erode further, with a number of market exits expected from smaller and mid-size firms over the course of 2013. 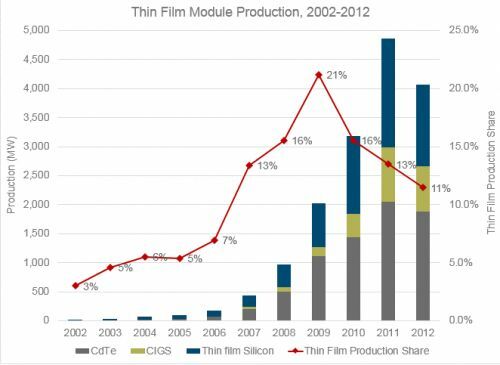 Looking at thin film production more closely, CdTe (almost entirely First Solar) made up 46 percent of total thin film production in 2012, followed by thin-film silicon (35 percent) and CIGS (19 percent). 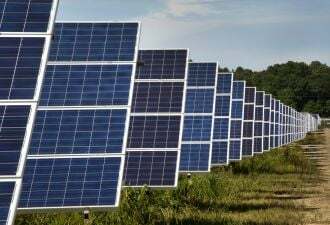 As with CdTe, CIGS production was heavily concentrated, with 550 megawatts of the total 778 megawatts produced coming from a single supplier, Japan-based Solar Frontier. As one would expect, the list of top PV producers is dominated by names from mainland China: there are 9 Chinese firms in the top 15 list for cells and 11 for modules. After two years as the world’s largest module producer, Suntech Power was pushed down to second place, with Yingli Solar ascending to top place for the first time ever. 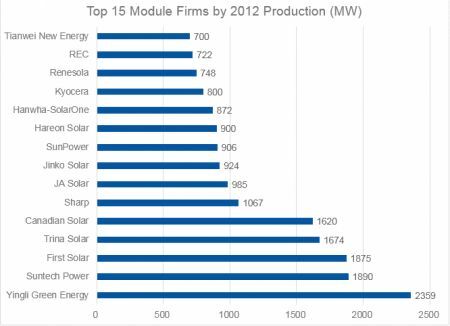 First Solar, Trina Solar and Canadian Solar rounded out the list of the top five module producers for 2012. In cell production, Yingli’s nearly 2,359 MW of production was followed by JA Solar (1,785 MW), Trina Solar (1,613 MW), Suntech (1,574 MW) and Taiwan-based Motech (1,309 MW). 11 firms are on both top 15 lists, suggesting that the integrated cell-module manufacturing model is still in favor, although many of these firms have been reported to contract external cells in small quantities when required. In total, the top 15 cell and module firms produced 55 percent and 50 percent of the 2012 total respectively, compared to 50 percent and 47 percent in 2011. This suggests that slowly but surely, market share in the industry is beginning to consolidate, and we expect this process to accelerate in 2013 and 2014. 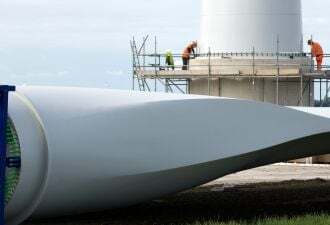 Eight firms produced over 1 GW of cells in 2012 compared to only one in 2009, reflecting that the age of the gigawatt fab is well and truly underway. Looking to 2013, the industry continues to struggle through the throes of structural overcapacity. GTM Research estimates global installations to come in at around 34 gigawatts this year, which represents meaningful growth over 2012’s 28.8 gigawatts, but is by no means large enough to fill the gap between available supply and demand. This means that rationalization of supply is essential for any balance to be attained. Until recently, there was scant evidence of any capacity rationalization or consolidation out of the most important production region -- China, with ailing producers continuing to maintain capacity and being shored up by local governments and banks. However, the first quarter of 2013 has witnessed a number of positive developments on some key fronts. Pricing for solar components has stabilized considerably since the beginning of the year, and a number of Chinese producers have taken capacity offline. As a leaner and fitter supply chain comes into contact with a market driven by sustainable high-growth markets such as the U.S., China and Japan, as well as emerging demand centers such as Latin America, the Middle East and the Asia-Pacific region, we are cautiously optimistic that a more balanced environment may lie ahead for at least the best-positioned producers in 2014. However, this is based on the assumption that at some point soon, manufacturer consolidation in China is enforced, or at least allowed to take place by the powers that be -- a development we anxiously await. Meanwhile, consolidation will continue to claim more victims as the year proceeds, and trade conflicts in Europe and China threaten to disrupt an already volatile value chain. GTM Research tracks quarterly and annual shipment and production volumes for global PV manufacturers as part of its Global Competitive Intelligence Tracker database. For more information on the Tracker, go here. For access to producer and facility-specific data, contact Justin Freedman at freedman@gtmresearch.com.